Go Outside and Play with These Great Outdoor Living and Entertainment Features! Today, we have a guest blog post from W. Neal Nesbitt, owner of Wilmington’s Shoreline Cabinet Company! Spring is in the wind and Summer is here, which means it’s time to turn focus to the great outdoors. 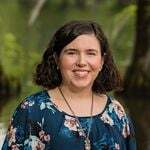 In southeastern North Carolina, we love to get outside and play. It is a season for grilling, lounging by the pool, and entertaining friends and family. 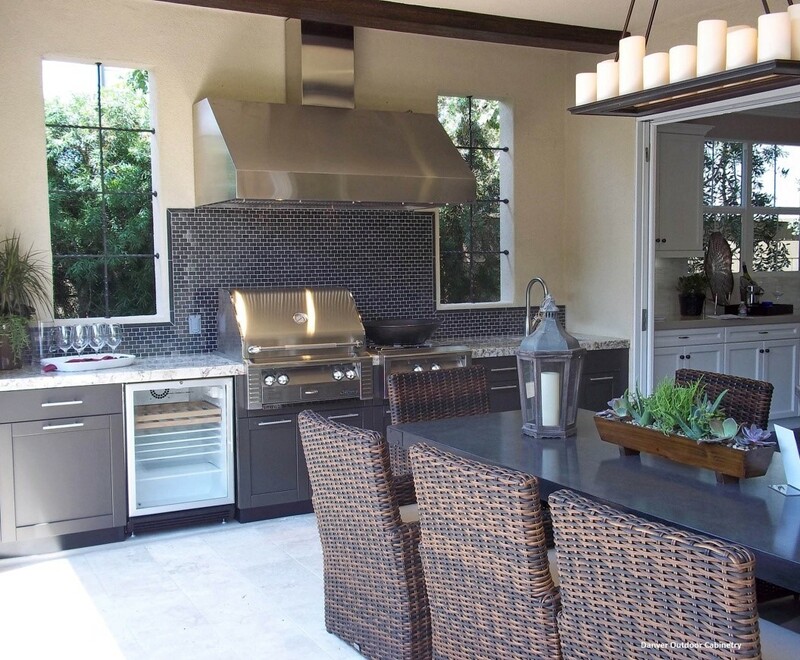 If you’re wanting that perfect back yard grilling or entertainment area, we at Shoreline Cabinet Company are here to share with you some of the great design features that have developed within the past few years. The Leisure Industry is growing rapidly. Just a few years ago, cooking areas were called “grilling stations”. 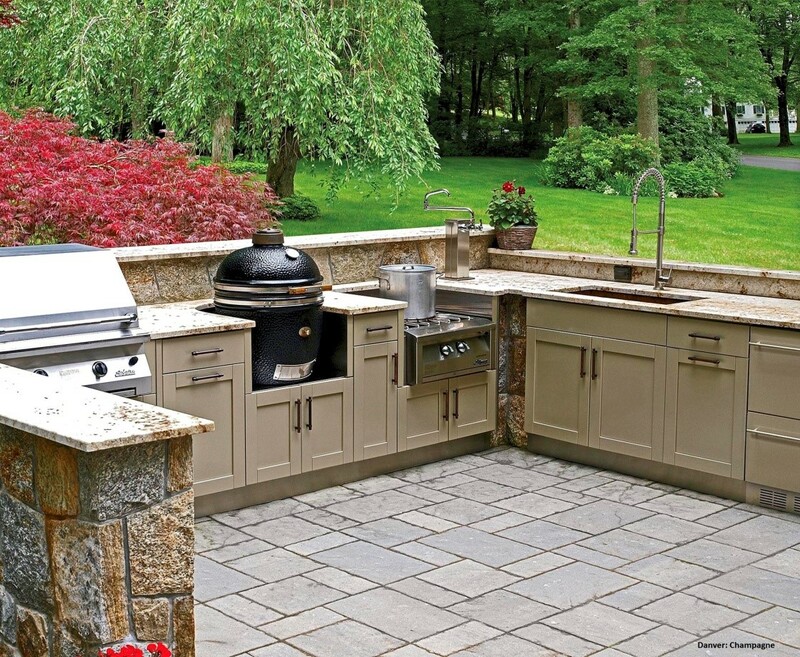 More recently, the term was “outdoor kitchen”. Today, we talk about “outdoor living & entertainment centers”. The kitchen (you may think “grill”) remains the heart of outdoor living, but the scope has expanded to not only include the grill and some outdoor furniture (many are familiar with the Brown Jordan name), but a whole host of outdoor living amenities, such as media, lighting, automated perimeter insect control systems (a must have with our summer pests), and heating to extend the season, among other items for the enjoyment of outdoor living. The grill remains an important aspect, but specialized cooking appliances are available, such as pizza ovens, power burners, ice makers, bartender centers, ceramic smokers/grills, refrigerators, and sinks and faucets. These are all part of the “new” outdoor equation. 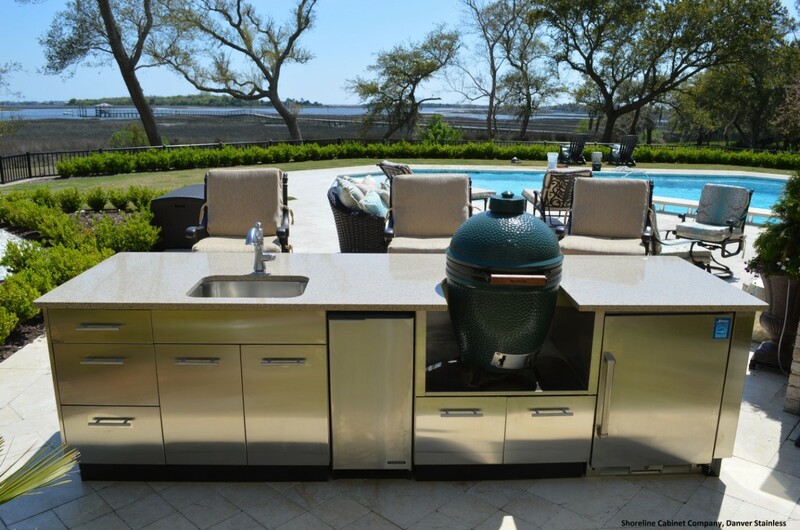 For years, when we thought of the outdoor cooking area, a BBQ masonry island would come to mind. This would consist of a stone wall with cutouts for a grill, side burner and maybe a sink and a few access doors that opened into a dark hole (spider catchers). In the past few years, there has been a shift toward modular cabinetry. 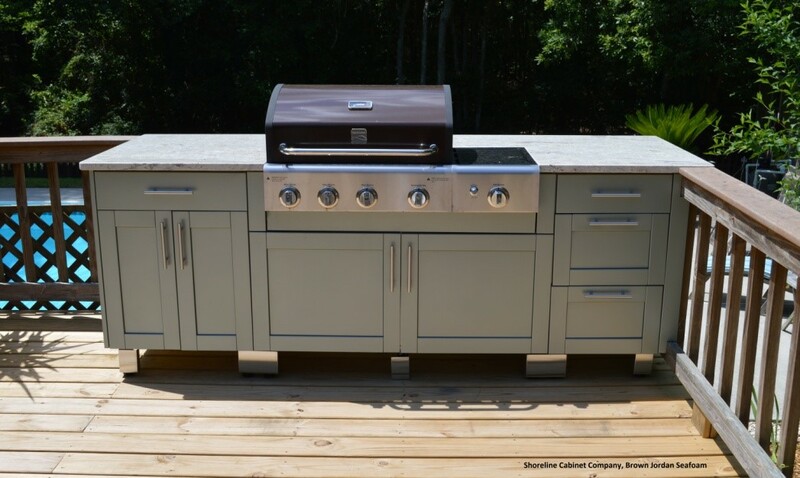 The cost of labor and materials, as well as time to build a masonry island – compared to the cost, speed, and ease of stainless modular cabinetry – make outdoor products like Brown Jordan and Danver a great choice. Color and finish options of our cabinetry help us to design a space that matches your outdoor furniture, or we can design it to be an extension of your indoor living space. 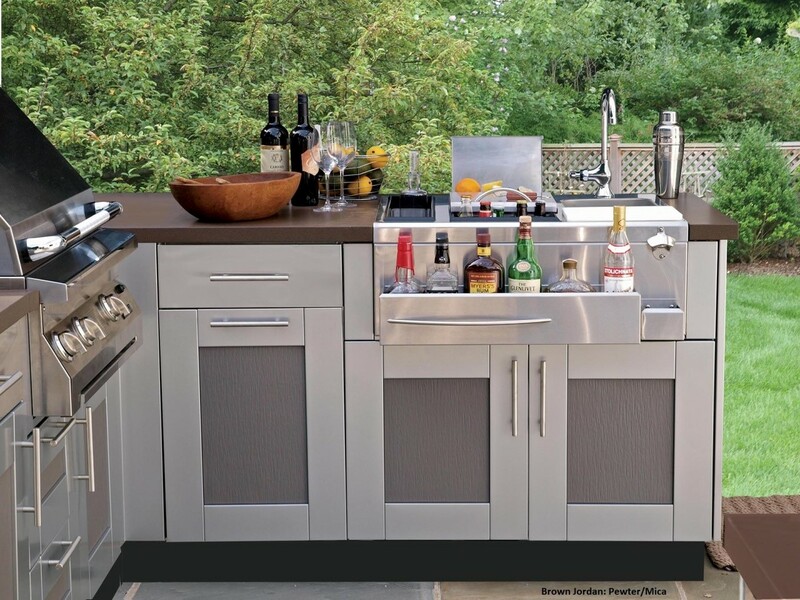 Special attention must be paid to the choice of bar or countertop material in an outdoor living environment. Granite is a natural choice, but place too dark a design in an area exposed to our summer sun and you won’t need the grill to cook. Many love the look of quartz tops such as Silestone, and Cambria, but some of these manmade products don’t hold up under heavy UV conditions. Contrary to what you may believe, wood tops such as wenge and teak (dense with high oil content) can be a natural choice for outside use, but I would suggest these areas be covered. Tile tops are an option as well, but tight grout joints are preferred. As you can imagine, there are many options for your outdoor living space and, with that, many key details to know, but we can help. With years of design expertise, as well as a thorough knowledge of cabinetry both indoors and out, we can get you out and into the fun of outdoor living in no time. Please contact us for your consultation. W. Neal Nesbitt is the owner of Shoreline Cabinet Company in Wilmington, NC and designer with over 20 years experience. Graduate of the UNCW School of Business and a US Navy Veteran. Published in numerous local and national publications, as well as winner of kitchen design awards. Neal lives near Wilmington with his wife Dawn and their 2 boys.